Poll • Republicans say the seven-term senator is doing a good job; Dems and independents give him a thumbs-down. 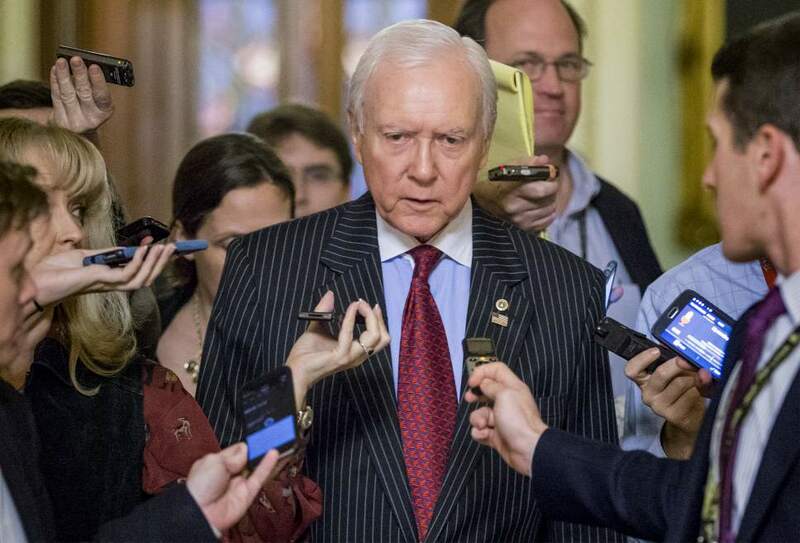 J. Scott Applewhite | AP File Photo Sen. Orrin Hatch, R-Utah. 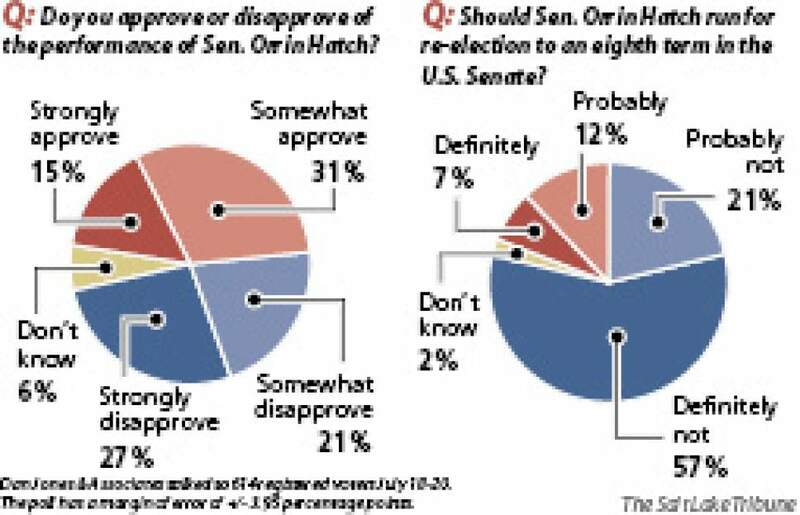 Washington • Utahns are split over whether they approve of Sen. Orrin Hatch&apos;s performance in office, but a large majority are sure they don&apos;t want him to run for office again, according to a new poll by The Salt Lake Tribune and the University of Utah&apos;s Hinckley Institute of Politics. Nearly 8-in-10 registered voters polled said Hatch shouldn&apos;t seek re-election, with 57 percent saying he should "definitely not" run. Those numbers mirror results from a January poll that found 78 percent of Utahns think the senator should retire at end of his seventh term. "Even though he&apos;s in a powerful position  chairman of the [Senate] Finance Committee, [former] longtime chairman of the Judiciary Committee, Senate president pro tem  the voters are indicating they&apos;re ready for a change," said Tim Chambless, associated professor of political science at the U. "If I were the campaign manager for Senator Hatch, I&apos;d be very concerned." Hatch has said he intends to run for another six-year term, though won&apos;t officially make the call until later this year. He had said during his last run in 2012 that that would be his final bid but now says President Donald Trump, fellow senators and business leaders are urging him to continue on. Hatch&apos;s office largely ignored the poll results in responding to the findings, instead focusing on Hatch&apos;s position in the Senate and the work he&apos;s doing. "In an era of unprecedented gridlock and division, Senator Hatch is leveraging his leadership and successful legislating experience to encourage civility, bipartisanship, and collaboration among his colleagues," said Hatch spokesman Matt Whitlock. "He&apos;s committed to serving the people of Utah and magnifying the duties of his office to tackle the toughest issues facing our nation. While he hasn&apos;t made a final decision about a campaign that&apos;s more than a year away, he hopes to by the end of the year." As for the job Hatch is doing in Congress, 48 percent give negative marks and 46 percent positive reviews, the poll showed. 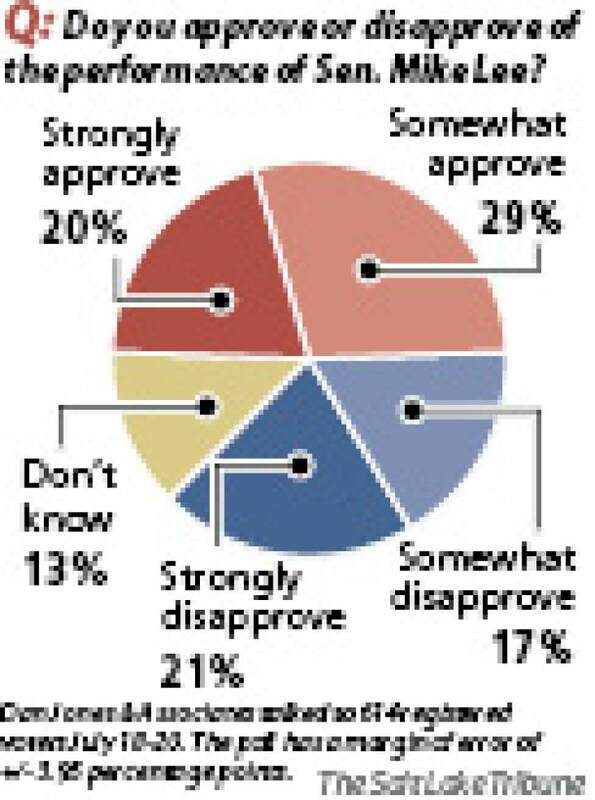 Only 6 percent of respondents were unsure of how to rate the Utah Republican. Hatch&apos;s approval rating has dipped some since a Tribune-Hinckley Institute poll in January that showed just more than half of Utahns approved of the job he&apos;s doing and 47 percent disapproved, although the change is within the survey&apos;s margin of error. Chambless notes that Hatch  who has more than $4 million in his campaign account  has the power of the incumbency and can raise a lot of money, though the poll numbers suggest he could be "vulnerable" from a challenge from within his party or a "viable Democratic candidate." Salt Lake County Councilwoman Jenny Wilson, a Democrat, is the only announced candidate for the Senate seat next year. She said Thursday that Hatch has been a "good public servant and a committed senator" but that Utahns are ready for someone new who can focus on them. "He has spent far too much time in Washington and with so many years running really a political machine, and I think Utahns and their basic needs have been overlooked," Wilson said. Meanwhile, about half of Utahns approve of Sen. Mike Lee, with 49 percent giving him good marks and 38 percent disapproving. Some 13 percent were unsure. Lee&apos;s office declined to comment on the poll. The survey shows Republicans love, and Democrats dislike Lee, who was re-elected last year to a second term. About 66 percent of Republicans approve of his job, while 75 percent of Democrats do not. The survey also shows Republicans clearly like Hatch more than do Democrats . Of GOP respondents to the poll, 31 percent said they strongly approved of Hatch&apos;s job performance with 35 percent saying they somewhat approved. Some 47 percent of Democrats strongly disapproved of Hatch&apos;s work and 28 percent somewhat disapproved. Overall, 30 percent unaffiliated voters surveyed gave Hatch good marks while 64 percent disapproved. A Utah Policy poll  conducted in April by the same longtime pollster, Dan Jones & Associates, that the Tribune-Hinckley Institute used  showed Hatch with 48 percent disapproval and 46 percent approval. Though he has now left Congress for a gig on Fox News and to write a book, former Rep. Jason Chaffetz remains a divisive figure with voters. About 43 percent of Utahns approved of his performance while in office and 42 percent disapproved. About 16 percent of Utahns said they were unsure. 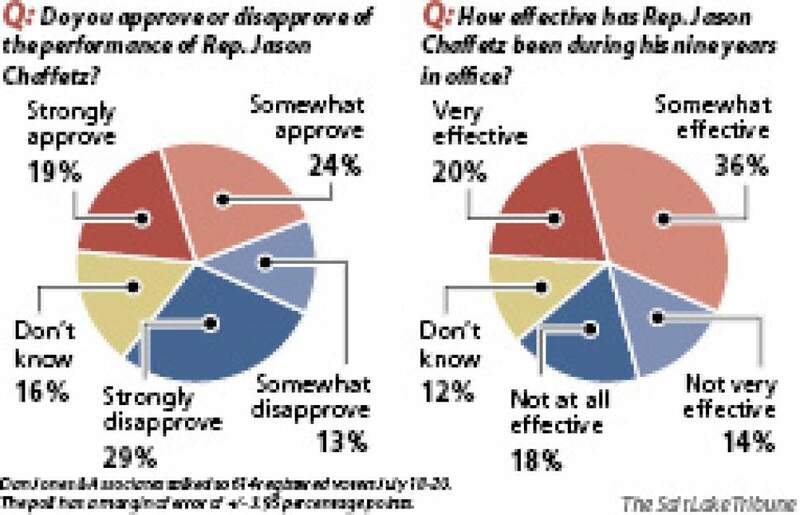 But a majority of Utahns, 56 percent, said Chaffetz was "very effective" or "somewhat effective" as a member of Congress. Some 14 percent said he was not very effective while 18 percent said he wasn&apos;t effective at all. Twelve percent were unsure. The latest Tribune-Hinckley Institute poll surveyed 614 registered Utah voters July 18-20 and has a margin of error of plus or minus 3.95 percentage points.